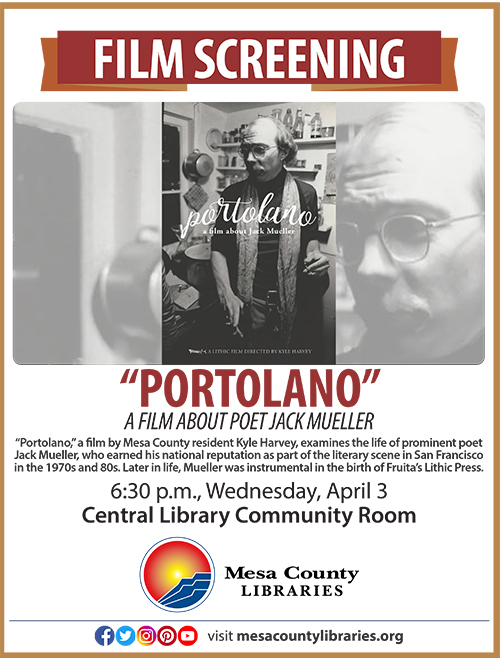 “Portolano: A Film about Jack Mueller,” a film by Mesa County resident Kyle Harvey examining the life of prominent poet Jack Mueller, will have a public screening at 6:30 p.m. Wednesday, April 3, 2019, at the Mesa County Libraries Central Library, 443 N. 6th St. in Grand Junction. The film screening is open to the public at no charge. “Portolano” details the life of poet Jack Mueller, who earned his national reputation as part of the San Francisco literary scene in the 1970s and 80s. Mueller moved to Ridgway in the early 2000s, inspired many western Colorado poets, and was instrumental in the birth of Lithic Press in Fruita. Mueller died in 2017 in Grand Junction. The film weaves together interviews with literary icons such as Neeli Cherkovski and Jack Hirschman, archival photographs, audio recordings, and ephemera of the legendary North Beach, San Francisco scene of the 70s and 80s to create a vibrant, poetic portrait of Mueller. Film Director Kyle Harvey is a poet, filmmaker, songwriter, photographer, and artist who personally knew Mueller. Harvey was a finalist for the Colorado Book Award (“Hyacinth,” Lithic Press 2013) and winner of the Mark Fischer Poetry Prize. His poems have appeared in numerous publications. He lives with his wife and children in Fruita, where he designs books for Lithic Press and manages Lithic Bookstore & Gallery.